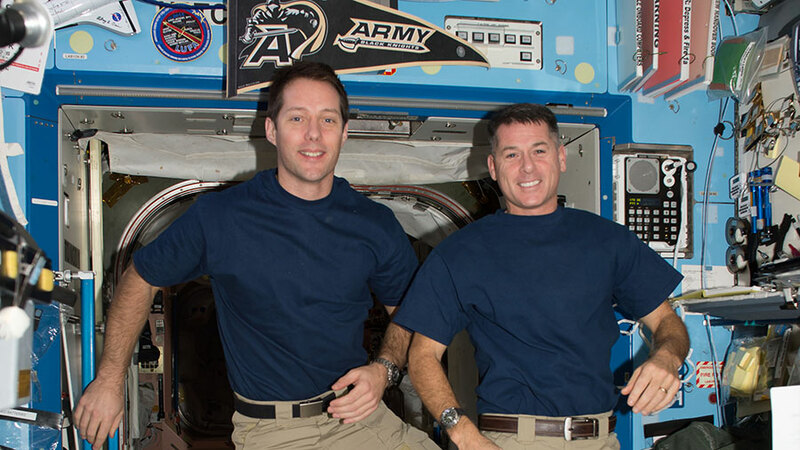 Astronauts Thomas Pesquet and Shane Kimbrough pause for a portrait inside the space station. Six International Space Station crew members are heading in to the Thanksgiving holiday with human research activities and orbital lab maintenance. NASA astronaut Peggy Whitson is the most experienced crew member in space right now getting ready to spend her third holiday season on orbit. Today, she stowed the tools used for space plumbing work done on Tuesday putting the Waste and Hygiene Compartment, the station’s toilet, back in service after a leak was discovered. She and her new crewmates, Oleg Novitskiy from Roscosmos and Thomas Pesquet from the European Space Agency, are in their first week aboard the space station. They are getting used to their new home in space and familiarizing themselves with station emergency gear and procedures today. Whitson is beginning her third mission aboard the orbital complex while Novitskiy is starting his second mission. Pesquet is on his first mission and is France’s fourth astronaut to visit the space station. The rest of the crew members, including Commander Shane Kimbrough and Flight Engineers Sergey Ryzhikov and Andrey Borisenko, are beginning their second month in space. Today’s science work included collecting breath samples to help doctors understand how living in space affects bone marrow and blood cells. A new device that indirectly measures an astronaut’s intracranial pressure is being checked out today while the crew is also conducting eye exams. Same, Wish them Good Luck! And hopefully thanks to this EmDrive thing will take care of space fulage problems.